The vases are beautiful and so is that broken lily that is in it! It’s true that it’s difficult to find single bud vases these days. I still have to have some luck in finding bargains as you do. I can see your vision of the China men staring at you while you are in bed. Yes, it’s good that it’s only on a small wall. I would think it might be too much traffic if you had it on 4 walls… funny how it was a fad in the 80’s to have wallpaper all over. LOL…the wallpaper does distract from the topic at hand. I came across somewhere that pious Eastern Europeans turn icons in their bedrooms around before they engage in family expanding intimacies to avoid precisely what you feel with your printed chinamen. 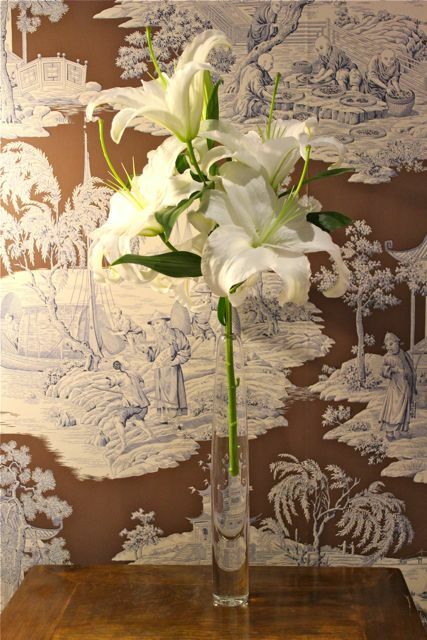 Wall papers, specially the traditional designs, usually depict chinese themes because the bulk of them were manufactured, hand painted for the most part and for the longest time, in China, either on paper or silk. I’m interested mostly in Chinese classical furniture. Oh shucks. I was just in Mandaue Foam’s main branch last Friday! You may not had any prepared evil tricks last Halloween but your wild imagination played tricks on you!….ha!ha!ha!…the Chinamen! when I was small I love collecting dolls displayed on open shelves in my bedroom but as I got older, the dolls creeped me out too and had to store them in boxes and later donated them. I go to surplus stores too…half may be junk but you do find gems once in a while. Hmmm…love the wallpaper! If I’m correct about your source, all her stuff is too die for! The vase is great, too. Drove past that Japanese surplus place this afternoon and thought that I should stop. I love those places…you are right about the bowls and serving pieces! At first glance at the top picture, I was already saying to myself, wow! 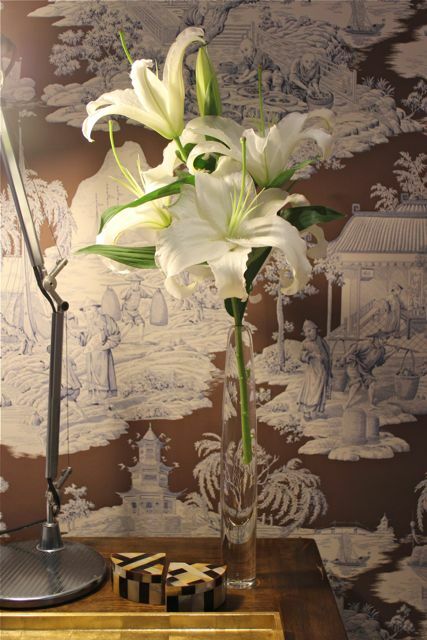 “toile de jouy” in a boudoir in MM’s household. Besides feeling the “chinamen” looking down from over your head, having the paper on four walls would feel overwhelming, but I like the brown and blue color combination and chinoiserie decor. With the beautiful bud vases….so elegant! Thanks for the tip, MM. Will check it out next time I’m in Cebu. We have a slightly upscale Japanese surplus store in our area but the goods are still too expensive. This vase is a steal. Over here, their vases cost P500 up and some can have chipped edge. 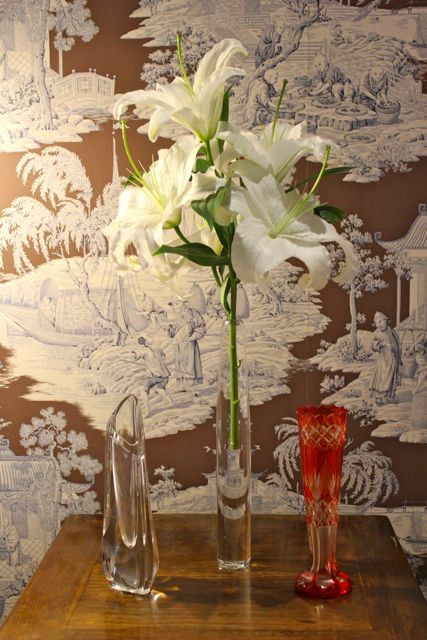 The Vases are simply stunning and I love the oriental design in the wallpaper behind. Very nice. I had to click page-up to give a second look (and third) to the wallpaper mentioned… hahahha… it does trick the eye. Ako rin when we were living in a military town in North Carolina, I visit the thrift shops, and lucky to find unusual items na ipinagbibili ng mga marines na-destino sa Japan, Korea, etc. plus pa yung mga items na tira-tira sa mga state auction sale, sometimes ceramics of 17th century. Hindi nga lang ako magaling sa pag-decorate ng mga ito, kaya most are still in boxes. Im obsessing over your bud vase. What a great find! The Japanese surplus stores around me here are crappy. Wish it had little gems like that. I’m loving the red vase MM. With the amount of water I consume I could use that as a glass. :) as always, a witty and interesting read. Hi MM hope you read The Philippine Star yesterday (11/5/12) Entertainment page (p5). I bet you got it all correct !!! I missed 1 ha ha ha ha. It’s 20 questions on how well you know Mr. Bond knowing you are a bond fanatic! $15 for an Orrefors is unheard of. Good buy MM. It looks very elegant with just that one single stem. I am a Chinaman, sorry, Chinese man. I don’t really take offense to that term, it’s more a caricature than a label. I even use it in some of my postings all over, referring usually to owners of hole-in-the wall eateries in Chinatown (think Dong Bei Dumplings) – the sando wearing cook serving great simple food in formica tabletops amidst white walls and hanging fluorescent bulbs with some loose, greasy wiring hanging on the edges. While some of my friends take offense to ‘Ints..” I don’t; I see it as just a colloquial term. But of course, in my effort to be sensitive to others, I don’t use it widely myself, only as a self-reference for some occasional self-deprecating humor. Having said that, yes, amazing bargains can be found in these surplus shops. We have a Korean surplus shop a few doors away and just two weeks ago, my cousin got a worn, slightly torn LV bag for P800, down form P1,200. She insists it’s genuine (she owns a couple). I don’t care one bit. Thrift shops have mushroomed here in Norway over the last five years. Truly, these shops also abound with too many “anik-anik” (my family’s version of kruk-kruk). One could buy such Orrefors vase for NOK10 a piece or more, depending on the size, condition, etc. My last find was a gold plated Georg Jensen candle holder (to hang on a Christmas tree) for NOK40.